Summary: Meet Kathryn Borel, bon vivant and undutiful daughter. Now meet her father, Philippe, former chef, eccentric genius, and wine aficionado extraordinaire. Kathryn is like her father in every way but one: she's totally ignorant when it comes to wine. And although Philippe has devoted untold parenting hours to delivering impassioned oenological orations, she has managed to remain unenlightened. But after an accident and a death, Kathryn realizes that by shutting herself off to her father's greatest passion, she will never really know him. Accordingly, she proposes a drunken father-daughter road trip. 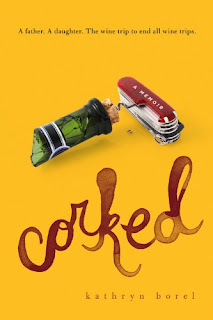 Corked is the uncensored account of their tour through the great wine regions of France. Uproarious, poignant, painfully introspective, and filled with cunning little details about wine, this is a book for any reader who has sought a connection with a complex family member or wanted to overcome the paralyzing terror of being faced with a restaurant wine list. Summary: Having lost the ability to see leprechauns, as it happens to the best of us as we grow up, he takes a trip to Ireland with his daughter, to study folklore and get back something that he knows he's lost if only he could put his finger on what that was. Twelve year old Margaret McNeil Mahoney will have none of it. She is, after all "the brightest pupil" at the La Madeliene Academy for (Exceptional) young Ladies and has no room in her life for such silliness as leprechauns and faeries. O'Shaughnessey has persuaded a reclusive Shenache (storyteller) named Moira McCarthy to take the visitors in, hoping that Bobby may eventually be able to see him again. Moira McCarthy is "Cold-school," as the jarvy who drives the pair to the hilltop farm describes her. "You won't find a drop of petrol on her farm says it stinks of death and nothing that comes from that far in the bowels of the earth can be good for the Gentry. The Gentry, that's what we used to call the faeries, and Moira McCarthy has kept with it." Thanks for the contest! I'd love to win these books. A book about food and wine! Oh I am so in...my two favorite things :). Thank you thank you for the opportunity to win! I would love to win these, I'm a follower and contact is on profile and/or my blog :) TY! I've heard great things about corked. Enter me please. I'd love to win these - what a fun addition to your giveaways. Oh-please-oh-please-oh-please sign me up! 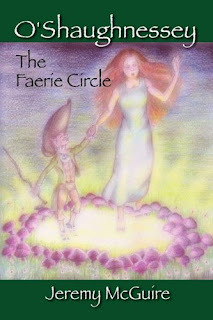 I can't miss out on a fairie book giveaway, being a full-blooded "Daughter of Eire" on the weekend before St. Patrick's Day!!! I'd love to have both of these! I'm a follower! These both look good. Sign me up. They sound good. I'm a follower.